TUCSON, Ariz. — By tagging individual bumblebees with microchips, biologists have gained insights into the daily life of bumblebees (Bombus impatiens) in unprecedented detail. The team found that while most bees are generalists collecting both pollen and nectar, individual workers tend to specialize on one of the two during any given day, dedicating more than 90 percent of their foraging sorties to either pollen or nectar. The observations also revealed that individual bumblebee workers differ vastly in terms of their foraging activity. Just like their domesticated cousins, the honey bees, bumblebees play important roles as pollinators, thus helping in agriculture and fruit production. But despite the ecological services they provide, many aspects of their biology still remain a mystery. By outfitting each bumblebee with a radio frequency identification, or RFID, tag — similar to the ones used to protect merchandise from shoplifters — the researchers were able to keep tabs on them at all times and log the data automatically instead of relying on human observations limited to certain times. “The way these studies have typically been done requires a human observer sitting in front of a hive entrance and taking notes all day, and nobody wants to do that,” said Avery Russell, a doctoral student in entomology at the University of Arizona. Once a bumblebee queen has mated, she burrows into the ground and overwinters. The following spring, she emerges and starts a hive that lasts until the fall. A typical bumblebee colony grows to about 75 workers, with about 40 to 50 going out and foraging on flowers for nectar and pollen. After the colony’s growth phase, the colony produces unfertilized eggs that hatch into males. The male bumblebees then disperse in search for other unmated queens to begin the cycle anew. The researchers were surprised to find a vast difference in efficiency, with the most active foragers making 40 times the number of trips each day as the least active workers. “Interestingly, when we studied the morphology between very active foragers and workers that barely leave the hive, we found that bees with more sensitive antennae foraged more,” Russell said. “If you watch a bee only for an hour or so, you can’t say what it will do over the course of a few days or over its whole life,” Russell said. To track the bees’ behavior, the team superglues tiny RFID tags to the backs of the bees. Each tag weighs only 2 to 3 percent of the bee’s weight. A Y-tube connects the hive to two arenas, one that offers pollen and one that offers nectar. 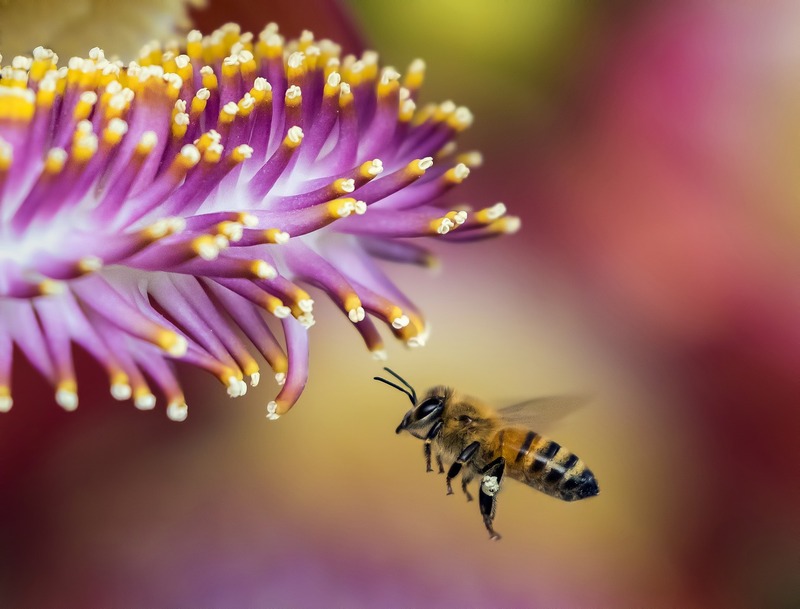 When a bee leaves the hive to forage, it can choose to go to the pollen chamber or the nectar chamber. Two RFID readers mounted at the entrance keep track of the bees going in and out and help the researchers collect a wealth of data. While honey bees are known to be very consistent and tend to stick to one species of plant and often one type of reward over a day, a phenomenon known as floral consistency, bumblebees were thought to be more generalist. The present study came somewhat as a surprise in that Russell’s team found the bees tend to make strings of foraging runs for the same reward on a given day. Researchers still don’t know why bees switch between foraging for nectar or pollen. Bumblebees that specialize in a task, either over the course of their lifetime or over the course of a foraging day, turned out to be no more active than their generalist peers, however. Neither were they found to be larger, more able foragers — raising the question as to why they specialize in the first place. As for the more domestic individuals that were found to forage far less than their more adventurous colleagues, Russell says that this might reflect economics of skill allocation.